Fly fishing classes in North Carolina Smoky Mountains for trout fishing is a week-long intensive course, in addition, the class is an intense immersion into all things fly fishing! Located in the beautiful Smoky Mountains town of Bryson City, NC. Bryson City offers the largest diversity of trout waters than anywhere in the South! Swain County (85% government) lands include Nantahala National Forest and the Great Smoky Mountains National Park hence a huge “fun hog” playground! The National Park is the most visited in the United States with over 14 million visitors annually. This is not your average “fly shop” instruction! College age kids that work a few seasons and move on to another occupation. All of the instructors have been outdoor professionals for many decades. They love to teach fly fishing! Meet our fly fishing instructors by clicking on the link for their bios. Three top whitewater professionals teaching river skills and rowing. Four Master Casting Instructors certified through the FFI. 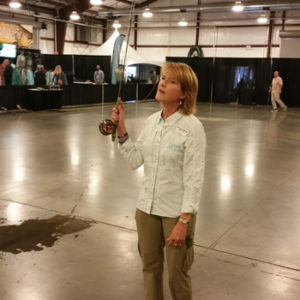 Three Fly Fishing Team USA members for teaching tactics and techniques. Two Hall of Famers into the Fly Fishing Museum of Southern Appalachia. The accolades are numerous and indicate the high level of professionalism consequently raising the bar for instruction nationwide. All of the guide schools are week-long classes and will improve your skills hence prepare your career as a fly fishing guide. The Fly Fishing Guide School has one of the largest databases for job placement. The simple lifestyle of working in the outdoors full time doing something you love is hard to beat! Learn to fly fish for trout in one of the most diverse ecosystems on the planet! If you are interested in day or weekend classes contact Mac Brown Fly Fish. Mac Brown specializes in fly fishing guide trips, instruction, lessons, and fly fishing schools throughout the year while all skill levels from beginners through advanced are welcomed! Come prepared to learn about the magnificent sport of fly fishing! The Delayed Harvest section of the Tuckasegee River has something for all anglers! Beginner fly fishers can expect double-digit numbers of trout landed while the seasoned anglers can expect triple-digit numbers of trout in a day on the water!